Shuffle the probe deck and reveal cards from the top of the deck until three Rebel systems and five Imperial systems have been revealed. Place a Rebel loyalty marker in each of the three Rebel systems. Place a subjugation marker in the first two Imperial systems drawn and an Imperial loyalty marker in each of the other three Imperial systems drawn. 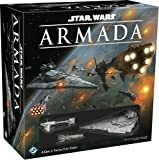 Return the five Imperial probe cards to the game box. Then shuffle all other probe cards back into the probe deck. The Imperial player receives 3 Star Destroyers, 3 Assault Carriers, 12 TIE Fighters, 12 Stormtroopers, 5 AT-STs, 1 AT-AT, and 1 Death Star. These units can be placed in any system that has an Imperial loyalty marker or subjugation marker. At least 1 ground unit must be placed in each Imperial system. The Rebel player receives 1 Corellian Corvette, 1 Rebel Transport, 2 X-wings, 2 Y-wings, 6 Rebel Troopers, and 2 Airspeeders. 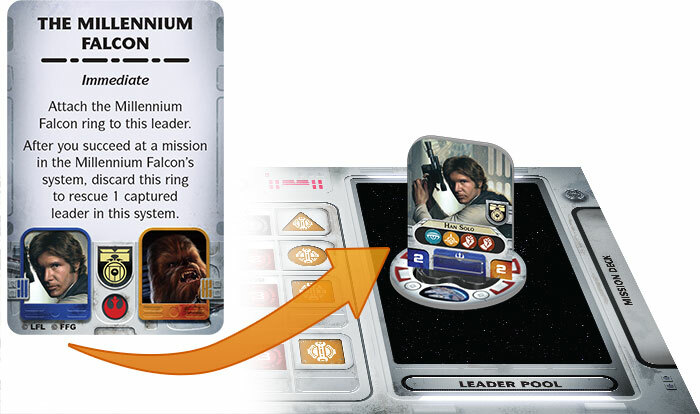 These units can be placed in the "Rebel Base" space of the game board and/or in any one Rebel or neutral system. Each faction draws two random starting action cards (i.e., the action cards without a recruit icon on them). These cards provide special, once-per-game abilities (see "Action Cards" below). Players then resume the basic setup steps. Action cards provide special, hidden abilities to leaders. During setup, each player receives two random starting action cards and places them facedown near his faction sheet. Players can look at their own action cards at any time. 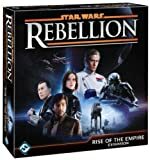 The other starting action cards are returned to the game box; they are not used this game. Each action card can be used once per game. When a player wishes to use an action card, he flips the card faceup, resolves its ability, and then returns it to the game box. Action cards used during a mission or combat can only be used if one of the leaders shown on the card is already in the system. The bold phrase directly above the ability specifies when the card can be used. Assignment: The card is used during the Assignment Phase. Instead of assigning a leader to a mission, a player can flip the card faceup and resolves its ability. Start of Combat: The card is used immediately after step 1 (Add Leader) of combat. Immediate: The card must be used as soon as the player gains the card, either during setup or after choosing it when recruiting a leader. The card is immediately revealed and resolved. Special: The card is used when specified on the card. Players can gain additional action cards during the "Advance Time Marker" step of the Refresh Phase. When a player recruits a leader during this phase, he places the chosen action card facedown near his faction sheet, and he places the unchosen action card facedown at the bottom of his action deck.